The purchase of Plymouth luxury boat builder Princess Yachts by a French billionaire is a "golden opportunity", workers' unions have said. Bernard Arnualt's investment group, L Capital, and LVMH, his luxury goods company, struck a deal worth an estimated £200m. Unions said the deal meant the firm, which employs 1,935 people, could expand its operation. The firm was sold by South African Graham Beck who bought it in 1981. Dave Springbett of the union Unite told BBC News: "This is great news. "LMVH is a big player in the luxury goods market and Princess Yachts fits in beautifully. "They want to grow this company and make it a world leader." He said that the firm had the space to expand with large areas of the naval yards lying unused. "The docks are shrinking and there is a need to diversify from the public into the private sector. "This is a golden opportunity for Princess." Princess Yachts International started as Marine Projects in Newport Street, Plymouth making 20ft (6m) day boats. 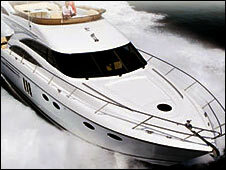 Now it sells a range of 80 boats topped by 95ft (28m) luxury cruisers. After Mr Beck took control of the company, it expanded its operation into a 1m sq ft (94,000 sq m) factory on the same site and has three other sites around Plymouth. The firm said it was "delighted" to team up with "one of the leading investment funds in luxury and aspirational brands". David King, managing director and founder of Princess, said: "This new partnership will bring lots of opportunities for Princess. "We could not have found a better partner who shares our vision for growth and who will help us develop a stand alone business that benefits from the expertise of its sponsors."